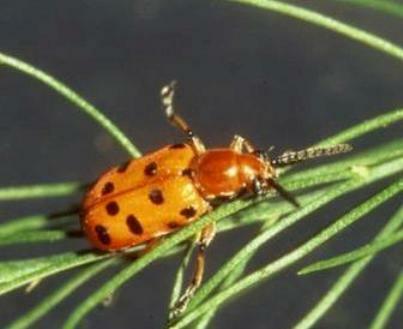 Region: This beetle is primarily common to the east, but can be found throughout most of North America. Life cycle: One to two generations are produced each year. The adults overwinter in the soil. Physical Description: This beetle is thinner and a little longer than the common asparagus beetle, 1/3 inch long. It is red or brownish with 12 black spots on its back, six on each wing cover. The eggs are dark brown to green and are laid on leaves, while the larva are orange with a blackhead and legs, and is a plump 1/3 inch long. Feeding characteristics: The larva do little damage, but the adults diet consists of spears and leaves in the early summer. Controls: Chalcid Wasps and natural predators and can be used. However, since this beetle can't fly in the cool of the morning hours, handpicking is a possibility. If a serious problem is present, then apply rotenone.